The fourth 3-pointer, almost a minute later at the 13:09 mark in the first half, put Auburn ahead 23-9. Brown, who entered the night fourth nationally in 3-point makes, made his first four 3-point attempts during a decisive first-half stretch to lead the Tigers past Kansas 89-75 in Midwest Regional second-round play Saturday night at Vivint Arena. The bonuses in Pearl's contract, while largely hidden, are more than likely for winning the SEC tournament and advancing this far in the NCAA Tournament. Jared Harper and Bryce Brown, the two guards who ignite the Tigers' offense, combined for 43 points. The 5-foot-11 Harper brought to its feet with a transition dunk and Brown made his first five 3-pointers as the Tigers raced out to the lead. Auburn finished the first half with 26 fast-break points. The Jayhawks didn't have the manpower to match the Tigers and were bounced from the bracket early after reaching at least the Elite Eight the previous three seasons. The Tigers finished Saturday's game with the program's largest margin of victory in the NCAA tourney since the opening round in 1999. 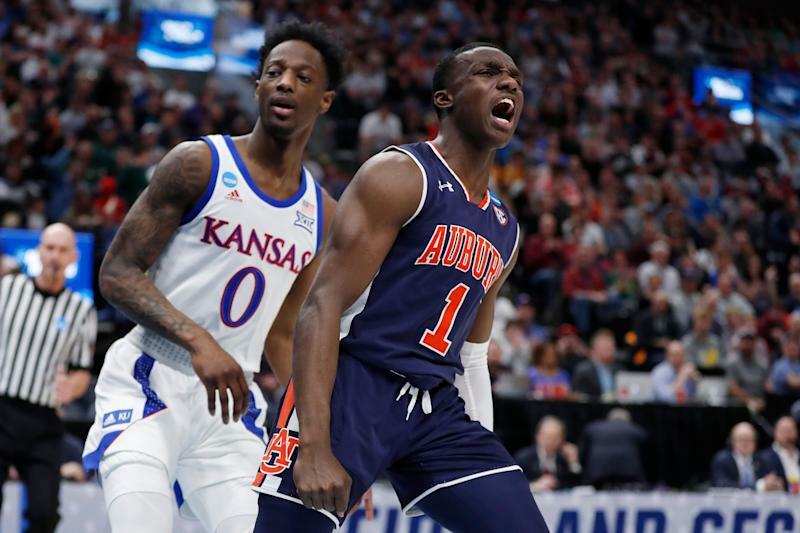 Auburn was too athletic for Kansas in the 89-75 win in the second round in Salt Lake City. Auburn did a good job, particularly in the first half, of fronting Lawson in the post and trying to deny entry passes to limit his touches. The Jayhawks hit 59.4 percent (19-32) of its shots in the second half and outscored Auburn 50-38 in the second half. Instead of the wild miss resulting in a possession for Kansas, Auburn's J'Von McCormick outraced every Jayhawk to the ball and calmly flipped it to Brown, who buried his fifth triple of the first half as KU coach Bill Self helplessly watched the ball's flight. For the Tigers to continue dancing on in their quest for the school's first basketball national championship, they must knock off yet another blue blood. It was not just the KU players who were brutalized and battered by the Tigers. Auburn's Bryce Brown hit five first-half threes, the most by a KU opponent in a half since Sam Hauser made five for Marquette in the first half on November 21, 2018. A season that started with Kansas ranked No. 1 ended with a second-round NCAA tournament exit. "The thing about it is, it's been a challenging year", Self said. "I think campus is going to be great". "He has all the confidence in us, so that makes us play even better". Their attitudes and everything (were) terrific. "I know the SEC is proud of us". "We hadn't seen an onslaught like that all year, the first 10 minutes of the game", Self said. And they rattled us and we didn't respond very well. And we didn't muster up enough momentum like some past teams have to probably go on a run like other teams have. "But being a 4 seed in the tournament, and so much of the tournament is matchups, as much as anything". They hit me at times that I wasn't even open and they just really like when I catch and shoot the ball.